The world of design is changing. Global issues such as decreasing resources, climate change and social imbalance dominate public debates and increasingly shape our surrounding, including things we use in our daily life. Nowadays, the work of manufacturers, product and industrial designers includes far more than production or industrial design of mass goods. Sustainable design is required: materials used for production should be as eco-friendly and renewable as possible, while production conditions should be socially fair. Moreover, the aim is to open new markets and to attract attention to these issues in a world shaped by modern media, in which current and short-term trends often seem to be more important than values and content. The distinction between superficial kitsch and genuinely innovative and significant objects is determined already at the stage of design development. Good product design has always been defined on the basis of such criteria as reliability, flexibility, adaptability and recyclability or reusability. The role of economic rationality, social compatibility and ecological needs in modern design has become more important than ever. These are the primary factors that characterise the concept of ecodesign. A number of famous manufacturer companies such as Vitra provide a good example for everyone else with their eco-friendly products. Timeless and innovative furniture design guarantees aesthetic appearance and long service. Furthermore, desk chairs such as MedaPal have been awarded with the Greenguard certificate and the Blue Angel eco-label. They are recyclable by 94% and 92%. Further examples of successful ecodesign have been demonstrated by small manufacturers, such as the Indonesian company Magno. The designer Singgih Susilo Kartono produces handcrafted wooden radios – each of them takes 16 hours to be made. His company ensures the income of many families in his home village, Temanggung (in the middle of Java), and gives his young employees a career perspective in fair social conditions. An arboretum, which was founded next to the Magno workshop, supplies the whole village with young plants. Singgih Kartono aims to facilitate long-term oriented ecological sensitization of locals. In his production, he uses only cultivated timber. Companies such as Muuto, Hay and Emeco also experiment with eco-friendly and innovative materials. These companies produce products from so-called PET felt. PET (Polyethylenterephthalat) is mostly used in production of PET bottles, which can be recycled into a felt-like material and used in production of other objects. 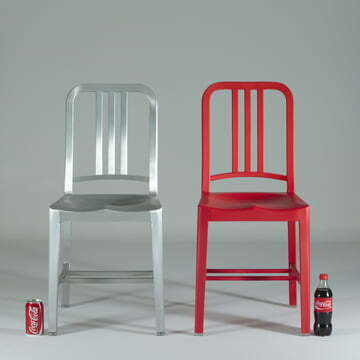 From storage baskets to chairs, there aren't many things that cannot be produced out of recycled Coca-Cola and water bottles. At the same time, other composite materials such as ceramic-plastic mixtures or wood-plastic composites are also very trendy. Other producers rely on renewable materials such as natural felt. The assortment of the German company Hey-Sign, for example, consists only of natural felt products (out of 100% pure new wool) – from pillowcases to carpets. Felt has the following advantages: it is permeable to air, agreeable to the touch, elastic, heat-insulating and dirt-repellent because of its natural fat content. Therefore, in addition to being eco-friendly, pure natural products usually offer many more benefits than their synthetic counterparts. Many designers, producers and manufacturers recognized the advantages of ecodesign and adapted their product development as well as whole product life cycles to the corresponding social, economic, technical and legal conditions. Times of obsolescence have ended, hurray to long-lasting products! At Connox, both social responsibility and protection of the environment have become some of the most important priorities. Thus, our business policy is governed by the principle of sustainability. Find out more about our ecological self-image. Alfred The founders of the company Marie Mees and Cathèrine Biasino expressed their passion for timeless and high-quality textiles with The Alfred Collection. Excellent bedlinen, tablecloths and tea towels made of linen. Made in Belgium. ames The Germany-based design brand ames was founded by Ana María Calderón Kayser in 2006. Internationally successful designers develop design concepts for the brand that reflect passion and enthusiasm. Boskke The name Boskke represents evolution in garden design. The New Zealand manufacturer improves conventional garden products for a contemporaneous, modern lifestyle. Carl Hansen & Søn Since 1908, the name Carl Hansen & Søn stands for outstanding craftsmanship made in Denmark. And still today, the manufacturer from Odense crafts with an uncompromising quality demand. Emeco The American company Emeco was founded in 1944 by Witton C. Dinges in Hanover, Pennsylvania. Emeco’s target is to combine the best materials and have them processed by the most competent craftsmen. ferm Living Ferm Living is a Danish company, which specialized on the development and manufacturing of furnishing objects with a graphic touch. Hey Sign Since 1999, the company Hey Sign has produced innovations out of felt made in Germany. Felt can be used flexibly and is also a renewable resource that boasts unique characteristics. Kalon Kalon is known for its strong focus on material and a no-compromise approach to quality and sustainability. Recognized as a thought leader in this design, Kalon has until now won numerous awards in the United States and Europe. kommod Easy, convenient and enjoyable - this is Kommod’s credo. The German company has committed to intelligent design and sustainable solutions for small and practical pieces of furniture made of wood. LindDNA LindDNA is a Danish company based in Aarhus that produces home accessories and furniture made of Danish wood and recycled leather. Simple and sensual designs are thus created. nanimarquina To date, nanimarquina represents unique, traditional carpet art. Carpets in classical and modern design made in fair manual labour. Paper Collective “Good graphics – good causes” is the philosophy of Paper Collective. The Danish manufacturer produces iconic design posters and all of it for a good cause. Ruckstuhl The rugs factory Ruckstuhl has produced high-quality carpets out of natural fibre since 1881. The family company has made a name for itself worldwide based on its exclusive carpets. Skagerak The famous Danish furniture company Trip Trap changed its name to Skagerak in 2005. For more than 25 years this leading brand has stood for quality furniture for the garden and designer accessories for the home. Vitra Vitra furniture has included designs by Charles & Ray Eames and George Nelson since 1957. Due to this long history and years of cooperation with progressive designers, a wide branching furniture collection has developed. We Do Wood We Do Wood founded in 2011 in Copenhagen stands for a design which unites aesthetics, function and a respectful treatment of natural resources. A unity which creates excellent and environmentally friendly design.